Consulting for an Iron Chef’s philanthropic foundation is a delicious (and, of course, educational) opportunity. 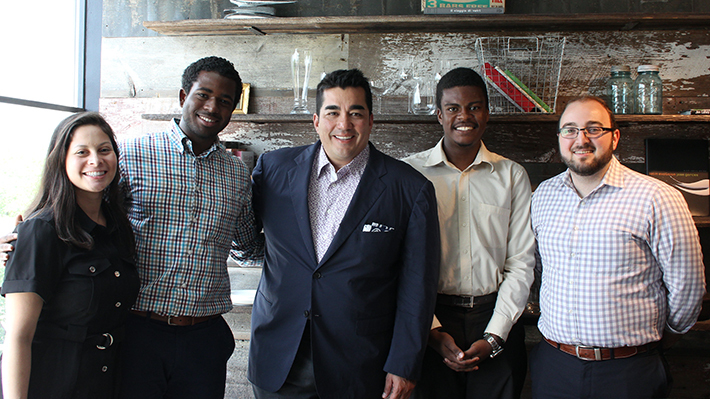 The Institute for Strategic Leadership (ISL) Student Scholars for Responsible Leadership recently concluded their research and presented the group’s findings before the full board of the Garces Foundation, including Chef Jose Garces himself. The students were charged with developing a plan to help the Foundation grow while remaining true to the goal of ensuring that underserved immigrant communities have access to health and educational services. “As the Garces Restaurant Group presence grows in cities across the U.S. like Washington D.C., New York and Chicago, we asked the Student Scholars to design a plan for the Foundation to likewise expand in these cities,” explains board chairman David Maser. ISL Scholars Stephanie Arredondo, Jabari Jones, Roger Kfoury and Emmanuel Valery, under the direction of Daniel Korschun, associate professor of marketing, and Alison Young, executive director of ISL, presented a plan for smart growth and a social media strategy to help establish a presence in new cities. Their ideas were well-received and the gathering provided even more learning opportunities than expected. The presentations were delivered in a soon-to-open restaurant and test kitchen. The students were treated to a tour, a discussion of the business side of developing a new menu and, of course, a delicious sampling of some of the new menu items. LeBow senior Jabari Jones shares lessons learned through his co-op in economic development and as a “student intrapreneur” advocating for the community.